Chicken soup made by additive manufacturing in 1968. There's nothing that clears out a room at a party faster than the line, "remember on Star Trek...", but we couldn't resist posting a video that predicted the concept of additive manufacturing back in 1968. This was not the first reference to creating objects out of thin air on television, you need to go back to Lost in Space, Season 1, Episode "When You Wish Upon a Star" to see an earlier version circa 1965. You can watch it for free on Hulu. Below is a picture of Dr. Zachary Smith played by Jonathan Harris, wearing a magic helmet that provides two wishes (in the form of material objects) per day. 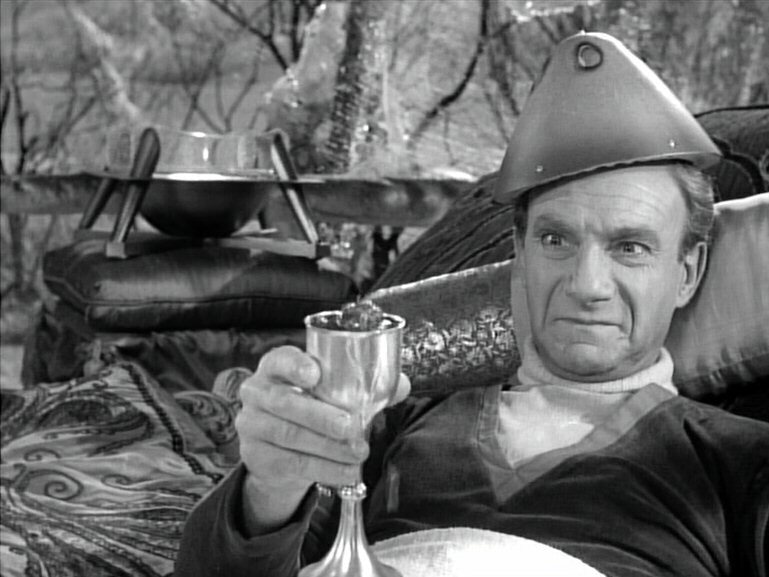 Lost in Space also predicted Bluetooth, there is a wireless link between that sweet hat and the barbeque thingy in the background that produces the products. Producer Irwin Allen did not try hard to make space travel very believable, but Lost in Space was an instant success (unlike Star Trek), due in no small part to Jonathan Smith's lovable villain, arguably the star of the show. Sadly, there are six Harris's on the Hollywood Walk of Fame, but Jonathan is not one of them. Additive manufacturing, also known as 3D printing, is all abuzz lately, but what does it mean for microwave circuits? Luckily, we have additional content from Dr. Andrew of Lincoln Labs. Thanks! The opposite of additive manufacturing, "subtractive" manufacturing is the mainstay of industry. Etched copper circuit boards, integrated circuits* processed by etching and lift-off processes, machined parts, and metal stampings all have one thing in common: waste material is removed to create the part you seek. In theory, additive manufacturing stands to reduce waste. Molded manufacturing could be considered "additive" but it has been around for centuries so it is excluded from the current buzzword. "Additive" today means applying material in a more intentional way than molding or extrusion processes, in a manner that can be quickly reconfigured to make different parts. 3D manufacturing automatically implies computer control of dispensing equipment. If you are a software engineer, go ahead and say "eeeww, hardware" and leave now. The rest of us enjoy seeing actual stuff being created, and developing advanced manufacturing techniques are the only thing that can help us from creating the next rust belt economic mess. Pretty soon, software will be created by software, enjoy the ride while it lasts. 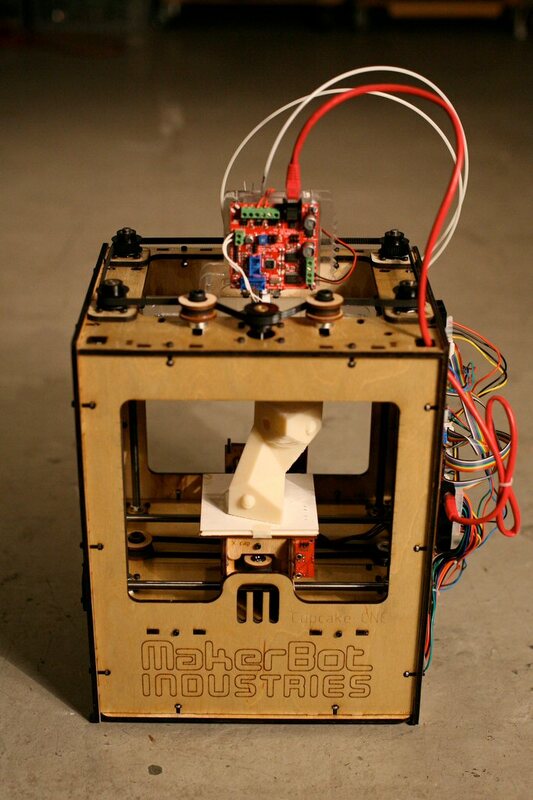 Below is a video of a 3D printer making a small house. Note that a concrete block machine can make enough blocks for 100 homes in the time this setup needs to complete one house, and block-laying employs many thousands of construction workers. In either case, concrete is not even close to a green technology, cement factories create 5% of the worldwide emissions of carbon dioxide. Just because a concrete home is provided for over 2 million inmates in United States penitentiaries, it does not follow that the rest of us would like to live in one. Early in 3D manufacturing history, big companies began to use 3D printers to make models of stuff they were developing, to show customers. This non-working hardware is kind of boring, and often someone low-paid engineer would get stuck having to paint it to make it look more real, as it was manufactured in one color. 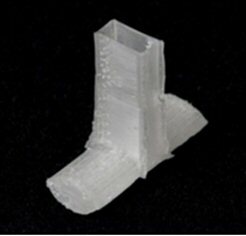 This experience was valuable to engineers as it began to show the limitations of 3D printing. Parts with fine features would break off, and if you were expecting smooth surfaces you were in for a disappointment. Some of the early examples of functional 3D printed microwave hardware include printing simple stuff like lids for housings. Here is where the need for metal properties first came into play. How do you get a piece of plastic to behave like a conductor? You can try to plate it with electro-less copper. Plating shops are no longer scratching their heads over this, it has become a common practice. 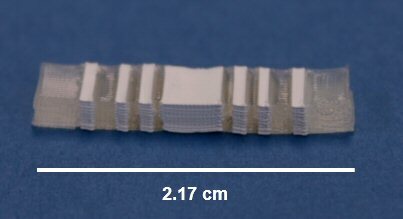 Swissto12 has made a play out of 3D printed waveguides at millimeterwave frequencies. The parts are produced in a polymer, then plated with a proprietary process. Later, metals were added into the mix, and you could get at least some conductivity, but 3D printed conductors have always been a poor substitute for pure copper or aluminum. So, now you have dielectrics and metals, what can you do? If you are like most Americans with low grasp of "tech", you might buy a 3D printer and download a model for something you didn't design, print it out, and think that you are a great innovator. Mom will be so impressed! Step it up. Today, you can hardly find a college that does not have some 3D manufacturing courses. 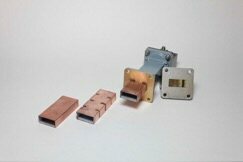 Check out regional college SUNY New Paltz, they are fabricating copper-plated waveguide parts. Fused deposition is probably the most common form of 3D printing, and is offered in very low-priced "maker-bots" for students and hobbyists. The idea is that solid material is melted and squirted by a moving nozzle (not unlike a hot-glue gun) to form objects. Stereo-lithography is a higher-end alternative. In this case, features are added by curing photopolymers with ultraviolet lasers. The photopolymer starts out as a liquid, the laser cures it a little at a time and the part is pulled from its primordial soup just like your ancestors, as shown in the video below. What are the advantages of 3D printing? Structures that have features inside a closed cavity, when machined, have to be built in pieces and then joined together. Now you can make the thing all in one piece... this in itself is magic! Strength: this is a disadvantage that has come a long way from the early days. But you will never make a 3D part that has the same strength as a metal part. For screw threads, you will likely have to glue in some inserts to be able to handle ordinary torque that even aluminum would laugh at. Thermal resistance: plastics are very poor heat conductors, but some of the more advanced material systems have particles of metal embedded. However, no 3D printed part is going to have thermal resistance of pure metal. Surface finish: if you watched the video on building a house with a 3D concrete system you will notice that the surface finish is extremely rough, due to ridges formed at each successive layer. This is not going to be a good thing for microwave performance (surface roughness is a cause of increased attenuation). The common way to fix this problem is to get out some sandpaper... a process invented over two thousand years ago in China. Note that this is not possible to sand the features inside a closed cavity which is typically where microwave engineers care about surface finish. The video below shows how to use acetone to smooth the surface of a useless 3D printed toy. Consider two things: acetone might not be a carcinogen, but it should be used with caution. Also, melting a surface to increase smoothness has the undesired effect of deforming features that are important to a design. Look what I made with my 3D printer, Mom! So shiny and smooth... can I have another cookie? The foremost trade is speed versus resolution: if you want to resolve 100um features, the printer will take a long time to build a part compared to 1mm features. First, some history: MIT Lincoln Laboratory is a federally funded research and development center chartered to apply advanced technology to problems of national security. LL is located in Lexington Massachusetts near (Laurence G.) Hanscom Air Force Base, roughly between the first battles two of the American Revolution (Lexington Green and North Bridge in Concord) along America's Technology Highway. Lincoln Labs started out as "PROJECT LINCOLN" after WWII, chartered to develop air defense systems using a newly-developed "high-speed electronic digital computer". Lincoln Labs was named for the nearby town of Lincoln Massachusetts, which is one of the only two "Lincolns" in the United States that were NOT named for our sixteenth president. Additive manufacturing work at Lincoln Laboratory focuses on creating printable dielectric inks that have low loss at millimeter wave frequencies. 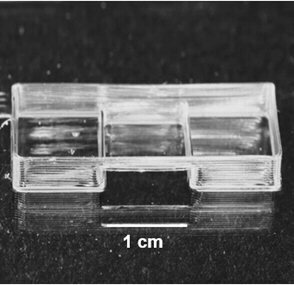 There has been work by other groups which use 3D-printed thermoplastics to make microwave parts, but these plastics have a high loss tangent (δ > 0.01). Some of the designs do not incur high losses because the plastic is merely a structural support onto which a good conductor is plated. Others accept the losses and try to minimize the field’s interaction with the lossy material. Lincoln’s approach focuses on formulating low-loss dielectrics that can be printed with sub-millimeter resolution. Below is a highly magnified image of a printed "Lincoln Log Pile". The image demonstrates the ability to print at 10um resolutions. Note that we are coming up to the 100th anniversary of Lincoln Logs. What will you be making to celebrate? The popular hobbyist approach to 3D printing is fused deposition modeling, where a thermoplastic is pulled from a spool, melted, extruded through a nozzle, and quickly cools into a solid at room temperature. As of 2017, only lossy thermoplastics are available for this technique. A different approach is used for low-loss dielectrics, known as solvent casting. In this approach, the ink is held in a reservoir and pumped out of a nozzle using high pressure. It’s kind of like printing with a tube of toothpaste. A key property of the ink is that it has low viscosity at high pressures, so that it may flow out the nozzle, and has high viscosity at standard atmosphere, so it behaves like a solid. This approach can print features on the order of 10um and self-supporting spans on the order of 1 cm. Below is a useless structure that demonstrates that the process is able to print long, self-supporting features. The ink is polymer-based and has a dielectric constant εr ≈ 2.5 and loss tangent δ ≈ 0.001. By adding dielectric nanoparticles, the dielectric constant can be increased to εr ≈ 4.0 without negligible degradation to loss tangent. The dielectric constant can be increased to εr ≈ 10.0 at the expense of increasing loss to (δ ≈ 0.01), which is tied to the loss of the nanoparticle material. The inks have been used to create filters which have good agreement with modeled results. Below are filters printed with the base polymer material and a polymer/nanoparticle mixture. These are two bandpass filters with identical outside dimensions. On the left is a filter printed out of a polymer with a dielectric constant of 2.0. On the right is a polymer/nanoparticle mixture with a dielectric constant of 4.0. Both fit inside a WR-28 waveguide. 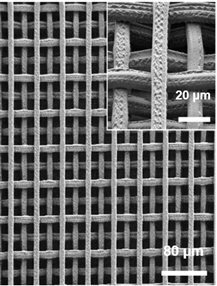 Two dielectric materials can be printed in the same print job. Below is a filter with both polymer-only ink, and polymer/nanoparticle ink. Structures more complicated than prisms have been printed. Shown below is a lens that is fitted into the end of an open-ended piece of WR-28 waveguide. The full structure is a cylindrical lens with a piece to hold it at the focal length of the lens. The holding piece is hollow to minimize wave interaction until the lens, and has a step in its outer width to stop insertion at the focal length. The curved surface at the bottom of the hollow tube would be difficult to machine with subtractive techniques. 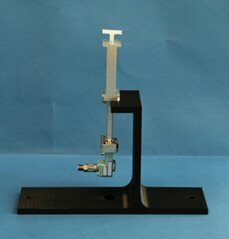 The lens improves the gain of the open-ended waveguide by 3 dB and agrees with simulated results.